This week #BlackLivesMatter protesters were charged with various crimes and restitution for the Christmas protests at the Mall of America. At the same time I’m reading the writings of Martin Luther King Jr. and hoping to actually attend MLK Day events instead of just enjoy another day off. I’m troubled by the continual question of whether or not black lives actually matter—questionable police killings, terror in Paris that trumps massacre in Nigeria, and condemnations for protests that inconvenience people. In this day and time when we celebrate the work and life of Martin Luther King Jr., why is it that we sanitize the man? We want to make him a hero of racial harmony, the winner in the battle for freedom and equal rights. We forget his challenge to the churches of the time, who stood by in silence while King wrote to them from his jail cell on scraps of paper. We forget that King not only wanted racial equality, but progress. Jobs, housing, education—King wanted fairness and equality in all of these areas of life. He was anti-war and even argued for a nationalized healthcare system. We forget all those unrealized dreams of Martin Luther King Jr. Instead we focus on free at last. We look around and decide that segregation is gone so we must have made it to the mountaintop. Such a vision of King allows us to declare his work done. Here in the North we like to congratulate ourselves that we weren’t the center of marches and protests, we didn’t unleash dogs and fire hoses. Yet here in the North, in Minnesota where we pride ourselves on being nice, it’s really just a facade. While our education system is the pride of the nation, it fails Minnesotans of color. Our achievement gap is among the worst in the nation. Blacks make up only 5% of Minnesota, yet they fill 37% of our prisons—the black to white disparity in our prisons is among the worst in the nation (Council on Black Minnesotans Disparity Analysis, PDF). Across the country the net worth of blacks is one-thirteenth the net worth of whites. 50 years after free at last why do these basic inequalities still exist? 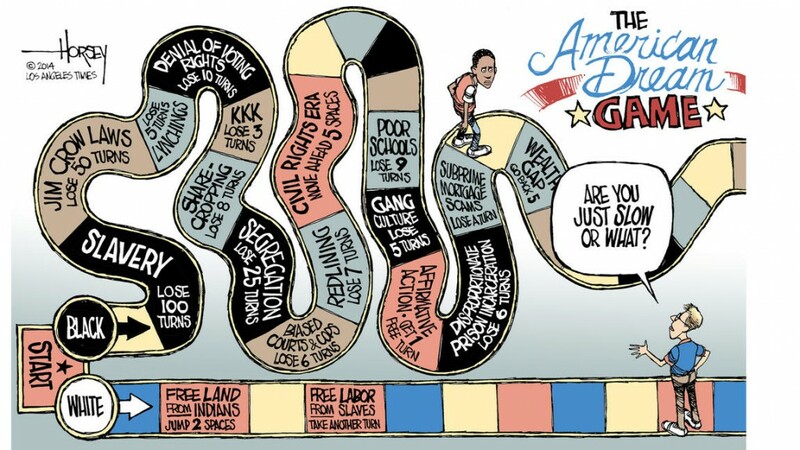 If we truly believe that all people are equal, if that’s the foundation of our society, the basis of our freedom, the ethos of America itself—then why do such disparities exist? It is time to open our eyes to the casual, hidden racism in our own hearts. It’s time to stop thinking that we are post-racial and realize the million tiny ways that our society is still segregated, still racist, still separate and still definitely not equal. Disagree? Then why are black people 20 times more likely to be stopped by police? And it’s not justified, because “whites stopped during traffic searches were found to carry contraband at higher rates than blacks and other minorities, [yet] resulting arrests and prosecution rate were ten times higher for blacks than for whites,” (Disparity Analysis). There’s Minnesota Nice at work. We think the black man needs to pull himself up by his bootstraps, but we forget, as Martin Luther King Jr. said, that the black man is actually barefoot. We bristle at the idea that a black person should get help that we never received. I worked hard to get to where I am today. Yes you did. But so did your parents and grandparents and great-grandparents, many of whom benefited by ousting Native Americans, by enjoying the benefits of free slave labor or milking the lives of sharecroppers. None of that is personally your fault or mine (and we bristle at the idea), but we have privilege lifting us up, while the black community has centuries of weight holding them down even today. It’s time we open our eyes to the realities. Today it’s not blatant Jim Crow laws, but hidden biases in our justice system that seek anything but justice. A white teenager caught with drugs made a simple mistake, boys will be boys and they’re given a slap on the wrist. Black teen drug offenders are thugs and gangbangers. They get criminal records. We villainize criminals today, forgetting that Jesus Christ was a criminal, falsely accused and executed by the state. While hanging on the cross with thieves and robbers on either side, he turned and forgave the criminal. When a black man is shot and killed by the police, we pull up every wrong the black man has ever done. We pull up his criminal record, the bad things he said, the questionable photos on social media. The forgiveness that is supposed to be at the very heart of our Christian faith goes out the window as we justify why this man deserved to be killed. He said bad things, once upon a time, so it’s OK for the police to shoot him. He robbed a store, so the death penalty is OK. Innocent until shot by police and proven guilty by a jury of sensational media. But he broke the law, so he had it coming. It doesn’t matter if that black man was 12 years old. It doesn’t matter if that black man was innocent. Forgiveness does not apply because that black man was a bad man. Not only was Jesus Christ a criminal, but so was Martin Luther King Jr. He sat in jail more than 30 times. The FBI had him under surveillance. They were more worried about this black man protesting and marching across the south than they were the KKK who were bombing and murdering across the south. This is where we are today. We have sanitized—dare I say whitewashed—the civil rights movement to make it safe and comfortable and convince ourselves that we arrived at the mountaintop a long time ago. That way we don’t have to look around at the injustices piling up at our feet. We can ignore them and keep on walking. 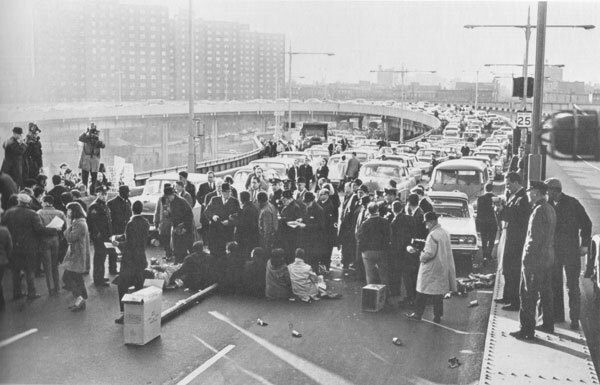 We can decry the protesters who block freeways and clog shopping malls, dismissing them and labeling them as law breakers and criminals, ignoring that these same tactics were used 50 years ago in the civil rights movement. We herald these actions in history but condemn them in the present. We do not have equality today. We do not have justice today. We have not made it to the mountaintop. As we celebrate the life and work of Martin Luther King Jr. and the many other civil rights pioneers, let us not give in to the thinking that the work is done. Let’s find today’s civil rights pioneers, today’s strugglers and join with them. If, like me, you’re wondering what to do and want to be involved and know how you can help, then join me in listening. Let’s read the powerful words of Martin Luther King Jr. His “Letter from a Birmingham Jail” is a good place to start. But let’s not stop with powerful words written more than 50 years ago (as amazing as they are). Let’s listen to today’s leaders like Nekima Levy-Pounds, a local civil rights lawyer and law professor at St. Thomas. She’s one of 10 charged with organizing the #BlackLivesMatter protests at the Mall of America and charged with $25,000 in lost income and police overtime, in addition to other fines. Let’s read books like The New Jim Crow: Mass Incarceration in the Age of Colorblindness by Michelle Alexander. Let’s attend MLK Day events and celebrate more than a sanitized legacy. Let’s begin to understand how the promise of American has been limited to a select few, and that struggle and protest are the only way that promise has been opened to all. Keeping that promise is never easy or automatic. For justice to roll down, the people must rise up. Let’s do the work to ensure that all people truly are created equal and have the same advantages and opportunities. Let’s make America the land of freedom and equality we claim it is.